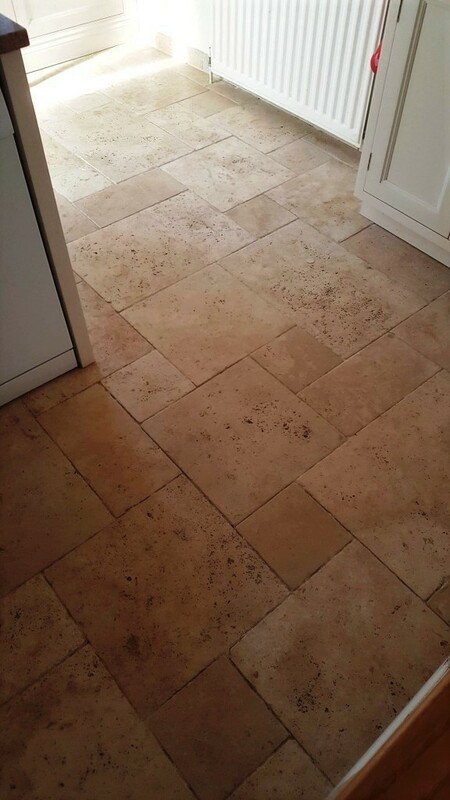 A customer from the village of Coningsby was having trouble keeping their Travertine tiled Kitchen floor clean. Another company had sealed the flooring previously, but it clearly hadn’t lasted and dirt had now become ingrained in the pores of the stone. As a result, mopping the floor wasn’t effective at removing the dirt from either the Travertine or the grout lines. This was a busy work kitchen that needed to have a floor that is easy to maintain; now frustrated with the way the floor looked they considered having it taken up and replaced but decided to contact Tile Doctor first looking for a remedy. We visited the property to survey the floor and discuss the issues they were facing with the floor. It clearly needed to be deep cleaned and then resealed properly with a more effective product. I explained our process and discussed the result they were looking for. They were happy for me to go ahead and requested a Matt finish rather than a shine or gloss look as it was a high use kitchen. I returned on the agreed date and spent the first day removing the old sealer that was no longer working and deep cleaning the flooring. To achieve this, I used a series for burnishing pads of different grits. After each pad the floor was rinsed using our Rotovac system which rinses the floor and extracts the dirty water off the floor at high speed. Although an expensive investment the machine makes light work of cleaning hard floors and saves a lot of time. After cleaning the floor, a turbo dryer was installed to speed up the drying process so the floor can be inspected, and any stubborn areas redone. The tiles looked nice and clean, but I could see some areas of grouting needed more work so these were hand scrubbed with Tile Doctor Pro-Clean followed by another rinse to remove the soil. At this stage I also noticed a few holes in the travertine that were filled for the customer with a matching colour. 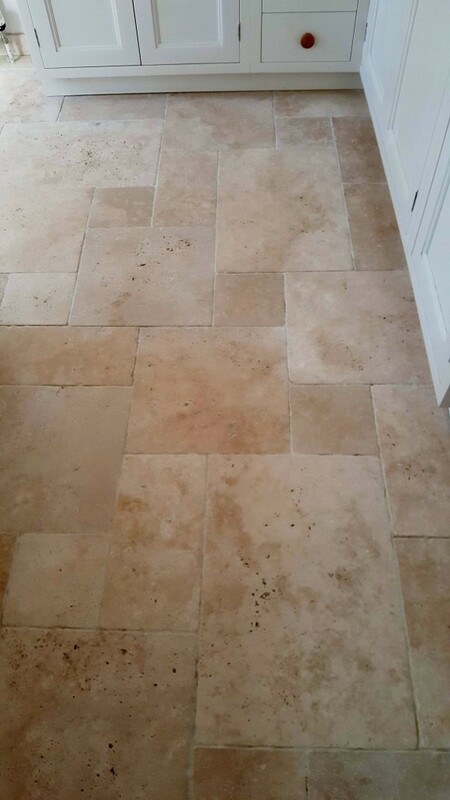 This is a common problem for Travertine and unfortunately, they easily attract dirt, so filling makes the floor much easier to clean going forward. We returned the following morning and tested the flooring with a damp meter to make sure it was fully dry. All was well and it was ready to seal with our quality impregnator Tile Doctor Colour Grow which protects the floor from within whilst enhancing the natural colours in the stone in the process. 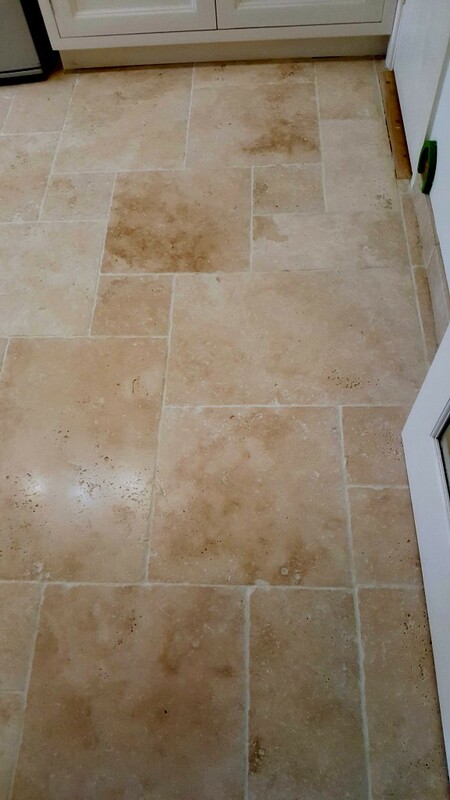 The Travertine proved more absorbent than usual for this type of stone and took three coats before a water test indicated the floor was fully sealed. You can see from the photo above that the water beaded up on the surface and can be simply wiped away even after a few minutes. This shows maximum protection has been applied. Given my experience with this floor I suspect the previous company had not applied enough sealer and this would explain why it failed, had they conducted a water test then this should have been obvious. We then gave a final polish with our buffer and a white soft pad to really strengthen the seal and give the best finish. I should mention that Colour Grow leaves a matt finish which matches the customer’s request. For aftercare cleaning going forward I left the customer a complimentary bottle of Tile Doctor Neutral Tile Cleaner that looks after the seal better than any high alkaline or acidic cleaners like bleach or washing up liquid which will prematurely erode the seal. The customer was delighted with the results, commenting on how much brighter the whole room looked. 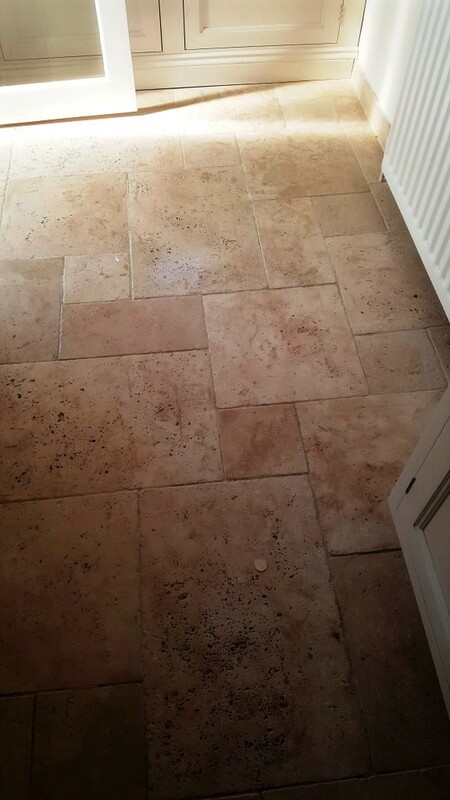 We recently visited a property in Saffron Walden, a pretty market town in Essex, where the owner asked us to look at her Tumbled Travertine kitchen floor. The floor had been laid and sealed around 10 years prior and the pits in the Travertine had become very dirty with trapped dirt, the floor now had a grubby neglected look about it. No matter how much they tried to clean with a multitude of household cleaners, the floor had become worse and worse which is not unusual as strong chemicals can strip off the sealer completely which protects the floor. It was clear that the original sealer was no longer doing its job and so I discussed the options for renovating the floor whilst carrying out a test clean. Sealers rarely last ten years, in my experience three years is about the maximum you can expect regardless of manufacturers claims. The test clean went well and we agreed a price and a timescale for the work and scheduled it for the following week. It’s not a good idea to apply a different sealer on top of the original unless you know they are compatible, also you can end up with uneven layers so our first step was to strip off any remaining sealer and clean the floor. To do this we used Tile Doctor Remove and Go which is designed for the removal of coatings on tiles such as sealers, adhesives and paints. This product is also great for drawing out ingrained stains and removing heavy grease build-up. It can be used on both vertical and horizontal surfaces. We applied and let it soak into the pores of the Travertine for ten minutes before working it in. To work the product into the stone and get deep into the pits a coarse 200-grit burnishing pad fitted to a rotary buffing machine was run over the floor and lubricated with plenty of water. After than the floor was rinsed with water and the slurry extracted with a wet vacuum. With the floor clean the process was repeated with finer grades of pads from 800-grit through to 1500-grit. As before between pad the floor was rinsed thoroughly to remove any trace of slurry off the tiles and the slurry extracted with the wet vacuum; the more thorough the rinse the better the finish. By the end of day one the cleaning process was completed, stripped of any coatings and the floor looked much better and lighter in appearance which made the room seem bigger. The Travertine tiles were left to dry off fully overnight and I started on the second day with a floor inspection to ensure the floor was ready for sealing. At that point I could see that there were a few small areas that needed further attention, so I spot treated them with Hand Burnishing Block. This was followed by spray-burnishing the floor with a very fine 3000-grit polishing pad which is applied using a little water sprayed on to the Travertine. This very fine pad left the floor with a natural looking sheen. Once we completed this and were satisfied with the finish, all that remained was the sealing of the floor, this will protect it and prevent the dirt from impregnating the pores in the stone. Three coats of Tile Doctor Colour Grow were applied, leaving thirty minutes drying time between each coat. Colour Grow is an impregnating and colour enhancing sealer which leaves the floor resistant to staining and spills whilst improving the natural brown shades in the Travertine resulting in a lovely finish. The client was very satisfied with the finish, the whole room had been lifted, looking much lighter and brighter.